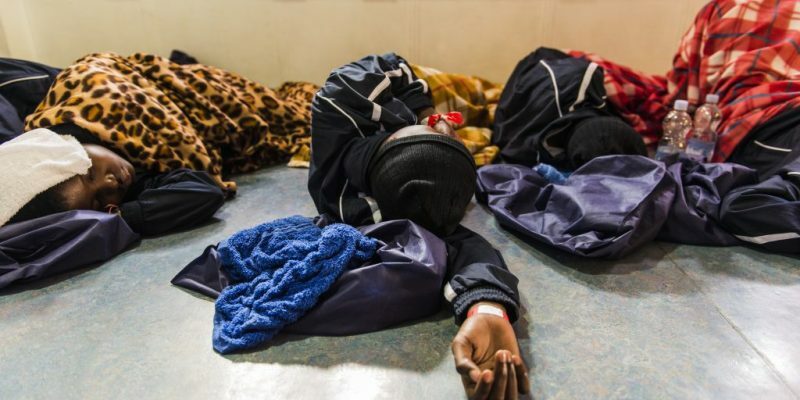 Over 170 migrants lost their lives in two separate shipwrecks last week, while 100 others who were rescued by the Libyan Coast Guard are being sent back to the country they were fleeing. Meanwhile, in Europe, crackdowns on refugees and migrants are everywhere. More than 170 migrants drowned over the last few days in two separate shipwrecks in the Mediterranean. The highest number of deaths occurred off Tripoli, where only 3 out of 120 survived, the rescuers found no trace of the boat which was carrying them. The other shipwreck occurred in the Alboran Sea, between pain and Morocco, and news of it only broke on Sunday. There were 53 fatalities. According to the UNHCR, “One of the survivors was rescued by a fishing boat after 24 hours at sea and is now receiving medical treatment in Morocco”. “Help us, I can’t speak for much longer because I am freezing”. A few hours after news broke of the two shipwrecks, another tragedy was about to happen: about 100 migrants on a boat in distress were awaiting help off the coast of Libya. A few hours later, a cargo ship sent by the Libyan Coast Guard reached the boat, and the migrants are now heading for Misratah. There has been pressure to stop them from being sent back to Libya, which many regard as an unsafe country. “Ports in Italy have been, and still are, closed”, Italian interior minister Salvini commented during a Facebook live stream. Speaking about the deaths, he added: “This shows that reopening the ports means more deaths, so no – our hearts are opened to those truly fleeing wars, but our ports are closed to NGOs, smugglers and the like.” These words seem to have no basis in fact, since the number of deaths since Italy closed its ports has 1.311. 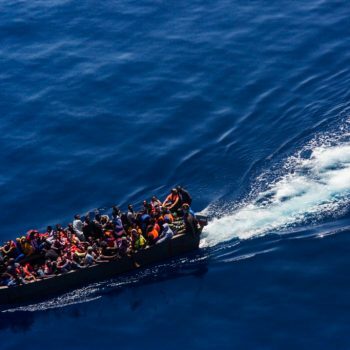 More deaths in the Mediterranean? Blame it on the NGOs. After the recent tragedies, Salvini has restated the connection between the number of migrant arrivals (and incidentally, of deaths at sea) and rescue operations, but it is a false one. In this article, Francesco Floris and Lorenzo Bagnoli had demolished this accusation a year ago. This article in Il Post is based on the work of ISPI researcher Matteo Villa, who also said categorically: “There is no such thing as a pull factor from NGOs”. It is more likely, as Giorgia Linardi from Sea Watch suggested, that “Without the NGOs at sea, the deaths are not even being reported”. “In 2018, 2,262 people lost their lives attempting to reach Europe via the Mediterranean Sea. UNHCR is concerned that actions by States are increasingly deterring NGOs from conducting search and rescue operations, and is calling for these to be lifted immediately”. “Wasting time is losing lives! While our ship is blocked, 8 people die in the Mediterranean Sea every day.” This is an alarm call from Open Arms, whose ship has been blocked in the port of Barcelona for a week. While Italian interior minister Salvini commended the decisions of the Barcelona maritime authority, a court in Sicily released the accounts of the Mediterranean shipping agency based in Augusta, which had been frozen within the investigation into waste mismanagement that had led to a motion to seize the ship Aquarius. Influential leaders in European Union states used migration to stoke fear, justify abusive policies, and block meaningful reform in 2018, even as arrivals at borders decreased. This emerges from the Human Rights Watch World report, which also touches on Italy. According to Paul Taylor, professor emeritus of International Relations at the London School of Economics, moderate leaders must talk about migration, and not let the populists set the course of the conversation through fear-mongering and racist dog-whistles. Read his article in Politico. Thousands of people have fled into following violent attacks by a faction of the militant group Boko Haram in north-east Nigeria. More than 8,000 refugees have crossed the border into Cameroon after the attacks on the Nigerian town of Rann on Monday, in which at least 10 people are thought to have been killed. “What struck me when we arrived was the silence. Usually Rann bustles with life, but yesterday it was eerie and quiet, like a graveyard. The town has been devastated and I was devastated to see it”, Isa Sadiq Bwala, an MSF nurse, said to the Guardian. Arriving in Italy after a time in Libyan detention and unjustly accused of being a smuggler, Peter was also fleeing Boko Haram. His expertise as an engineer made him a hero, and he will be able to pursue it in Cagliari. Tiziana Cauli wrote about him for us. Since January 3, around 40 people in a holding centre (Centre de retention – CRA) in Vincennes in the Paris region have been on hunger strike. That group were joined by about 70 migrants detained in another CRA in Mesnil-Amelot in the same region. Those on hunger strike are protesting against police violence and lack of access to adequate medical care: “Even animals are treated better than us“. 8,658 asylum seekers were required to leave Germany in 2018 under the Dublin Regulation, according to an Interior Ministry report obtained by German daily Süddeutsche Zeitung. The report was a response to a parliamentary inquiry by the Left Party. Italy was the first destination for deported asylum-seekers. The reform of Germany’s asylum system and the crackdown on refugees following the political changes after the election in the country were the subject of our in-depth analysis by researcher Federico Quadrelli. Meanwhile, the lower house of Germany’s parliament has voted the legislation changing the country’s asylum law, with the votes of the grand coalition of conservatives and Social Democrats, with the far-right populist Alternative for Germany (AfD) and the centre-right Free Democrats also supporting the changes. Under the new rules, Algeria, Morocco, Tunisia and Georgia would be presumed to be safe countries, making it very difficult for their nationals to apply for asylum in Germany. Conservative interior minister Horst Seehofer, who supported the reform, argued that the amendments only acknowledged what was already a reality. Ensuring the health of migrants and refugees is not only a humanitarian duty; it’s also in the interests of the societies that welcome them, in terms of public health and economic prosperity. Giovanni Sabato wrote in Le Scienze about two recent reports on the subject. The first one is from the UCL-Lancet Commission on Migration and Health, coordinated by Ibrahim Abubakar of University College London, presenting “the most comprehensive review of the available evidence on migration and health to date”. The other is No public health without refugee and migrant health, presented on January 21 by the World Health Organization. This report, the first of its kind, collects data on migration and health in the WHO European Region. In countries with good healthcare systems, the risk of contagion for residents is minimal, the clinical aspects are secondary and count as much as the structural and political factors, from social conditions encountered by migrants to discrimination, to access to social and health services. These are only some of the issues illustrated in the two reports.